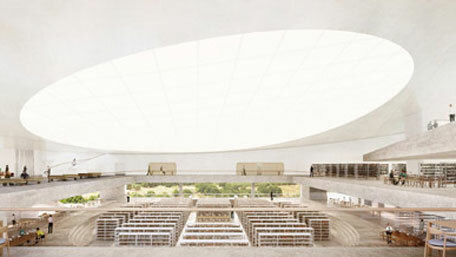 Architects Herzog & de Meuron have released the 'sculptural' designs for the new National Library of Israel. The 34,000-square-metre structure is being designed in collaboration with Israeli firm Shinar Architects. It will comprise six storeys, four of which will be buried underground, Dezeen reports. As well as housing a public library, the stone-clad building will include research laboratories and offices, educational facilities, a visitor centre, a multi-purpose hall and a climate-controlled archive. "The strong, sculptural form of the stone, related to the specific topography and context of the site, is elevated off the ground, and situated above vitrine like elements. The stone contains a large open space for the library's visitors and users to interact while the vitrines expose the collection, reading room and public functions to the street and adjacent surroundings," said the studio. Images and details on the Dezeen website.